This research and analysis demonstrates that an emissions containment reserve (ECR) would provide several important benefits to help improve the functioning of the market for emissions allowances under the Regional Greenhouse Gas Initiative (RGGI). Since the Regional Greenhouse Gas Initiative (RGGI) launched in 2009, low allowance prices have been frequent and precipitated important design adjustments at the first program review. As a part of the ongoing 2016 program review, RGGI is considering a new provision, known as an emissions containment reserve (ECR), that would incorporate a minimum price for specified quantities of allowances under the cap and thereby introduce steps into the allowance supply function. This report uses simulation modeling and economic experiments to explore the implications of introducing an ECR and varying its design parameters. Whenever the ECR is in effect it allows advantageous changes in the demand for emissions allowances to be shared between the economy and the environment. From a behavioral perspective we find the ECR does not hinder price discovery in allowance markets. An emissions containment reserve (ECR) is a mechanism intended to support the program by reducing the number of emissions allowances that are sold at low prices. An ECR shares the risks and benefits of changes in the demand for emissions allowances between economic and environmental interests. It helps preserve the incentive for state and local government action and individual efforts to address climate change goals by enabling additional emissions reductions when prices are low. An ECR is transparent and can be expected to reduce price volatility, providing a more predictable market environment. Implementation of an ECR under RGGI would not eclipse the importance of regular program reviews, but it may make those reviews significantly easier to accomplish. 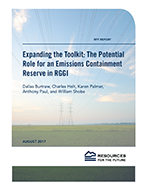 An Emissions Containment Reserve (ECR) for RGGI: How Might It Work? This webinar brought together experts and representatives from states, electric generators, academia, and nongovernmental organizations to consider this new approach for ensuring that the RGGI emissions trading program functions as designed and examine the finer points of how such a reserve might work and be implemented. Since the February webinar on the emissions containment reserve (ECR) concept, researchers at Resources for the Future (RFF) and the University of Virginia have been working hard on further analysis and modeling of the ECR. This webinar presented the results of this research; a final report will be released in early summer.